For orders above catalog quantities, please contact your distributor for production time. Medium Point: Black or Blue Ink. Barrel Color : Choose from the selection shown. Imprint Area: 1 3/4" x 1/2"
Color 2: Add $.12 per pen. Color 3: Add $.12 per pen. 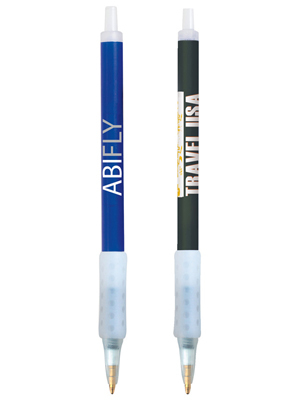 Imprint Area: 1 1/8" x 5/32"
Color 1: Add $.15 per pen. White is recommended except on clear barrel. Custom color match, specify PMS number: Add $32.00 per color. Packaging: Standard - 8 lbs. (approx.) @ 500 per carton. Special packaging (click here). Shipping: 2-day service at ground rates. BIC Air Express 1 Day Air. Click here for more information.